- HWD: 21.5" x 15.5" x 8.5"
- HWD: 30.5" x 21.5" x 19"
The Anchor Audio Acclaim Lectern is perfect for sound projection in indoor or outdoor settings and activities. The unit delivers 114dB of intelligible speech from one sound system designed for users with no technical knowledge. The Anchor Acclaim is truly versatile with true AC/DC operation and a 110/220 power supply and can run for 7+ hours per charge! Options include a built-in UHF wireless receivers. The system is ideal for schools, hotels parks & recreation departments or anywhere a portable lectern is needed. Add the optional base and the Anchor Acclaim becomes a floor lectern. The lectern base is also a portable transport case with tilt-n-roll casters for easy movement. The ACL-BASE dimensions are 30.5: x 21.5" x 18.5" and weighs just 38 pounds! The carpeted base makes it easy to attach logos and signage with Velcro. The carpet also prevents scratches and dings that can make other lecterns look worn over time. Questions and answer sessions with your audience are easy with the Acclaim wireless packages. With the wireless package the gooseneck mic can be used at the lectern and a wireless mic can be used in the audience for questions. No more shouting from the audience! All versions and packages come with a gooseneck mic, has 1/4" input if you want to attach a wired mic, and it can reach crowds of 500+ people. Just wheel it into place and use it at your next school spelling bee, speech, city council meeting, or other indoor/outdoor event! The Anchor Acclaim Basic Package includes your choice of wireless mic. Typically the gooseneck mic will be used at the podium making the wireless mic free for audience questions and answers. 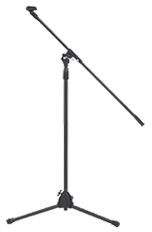 The WH-8000 Wireless Handheld Mic would be the easiest to pass around or put on a mic stand. The mic will transmit the sound directly to the Acclaim and heard through the lectern. A seperate volume control means you can adjust the volume on both the gooseneck mic at the podium and the wireless mic so one can never overpower the other. A speaker out jack is installed on the Anchor Acclaim to power an AN-1001X unpowered companion speaker. There is also a line out jack that can be used with any powered speaker system or used to record the presentation. Make it quieter...Add a second speaker! While adding the second speaker can make your system louder, it can also give you the ability to turn it down! By adding a second speaker you can have two speakers 50 to 100 feet apart feet apart and with this better coverage you can actually turn the sound down. This way the people sitting next to the speakers don't have to experience how loud your Liberty Platinum can actually get! A second speaker can always be added later or order the deluxe package now and get the stand and cable you need. The Next Generation Acclaim Is Here! Add a lightweight AN-1001X Companion Speaker for more sound! Base unit has Tilt-n-Roll casters making it easy to transport!